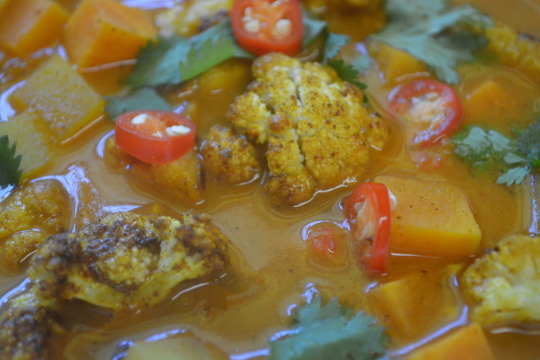 Take a small bowl out and mix the coriander, cumin, cinnamon, turmeric, salt, pepper and cayenne together in it. Place the cauliflower in a large mixing bowl, pouring one tablespoon of oil over the cauliflower afterwards, tossing to coat. Add one tablespoon of the spice mixture in with the cauliflower, tossing to coat again. Line a rimmed baking sheet with aluminum foil, spreading the cauliflower out in a single layer over the lined baking sheet afterwards. 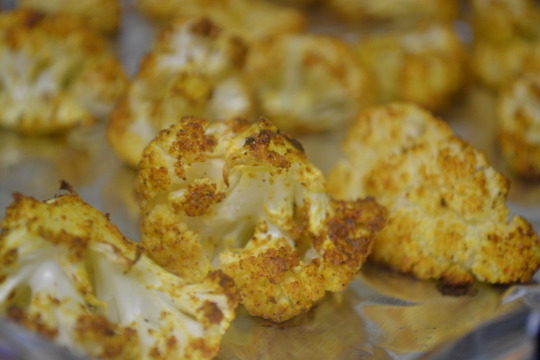 Place the sheet in the oven for 15 to 20 minutes or until the cauliflower looks browned around the edges. While the cauliflower’s roasting, take a large pot out and pour the remaining oil into it, setting the heat to medium-high afterwards. Once the oil’s hot, toss in the carrot and onion, stirring frequently for 3 to 4 minutes or until they start to brown. Turn the heat down to medium and continue to stir frequently for an additional 3 to 4 minutes or until the onion has softened. Add in the ginger, chile, garlic and remaining spice mixture, stirring constantly for one minute. Pour the tomato sauce into the pot, scraping up any browned bits and then letting it simmer for an additional minute afterwards. Add in the broth, potatoes, sweet potatoes, lime zest and lime juice, stirring to combine. Put the lid on the pot and bring the dish up to a boil, turning the heat up to high if necessary. Once boiling, turn the heat down so the soup is at a gentle simmer and let it cook (only partially covered now) for 35 to 40 minutes or until the vegetables are tender, stirring now and then during that time. Add the coconut milk and roasted cauliflower to the soup, stirring to combine. Return the dish to a simmer just long enough for everything to get heated through. You can garnish your individual portion with cilantro and chiles if you’d like. This soup is a brand new favorite of ours ! The spice mixture was so fantastic on the cauliflower that we’re going to make another batch of the spice mix just to see how good it tastes on other roasted vegetables, possibly creating new delicious side dishes ! The heat in this soup gets balanced so well with the other ingredients. There’s some acidity from the tomato sauce and lime but it’s more of a background flavor. All the flavors are just so well balanced. The coconut milk and tomato sauce gave the soup a silky texture. The potatoes and cauliflower give a hearty feel to the soup that will leave you feeling full. This is a great meal to have during cold weather but it tastes so good that you might find yourself fixing it during the summer as well ! We weren’t paid in any form to promote Colavita, Hunt’s, Swanson’s, or ThaiKitchen.